It is also worth noting that the Drag Reduction Device (DRD) will still be allowed next year, hence the ongoing development from the teams, particularly Lotus, Mercedes and Sauber. Beam wings will not be permitted in 2014 and this will rob the teams some rear downforce. Not only does the wing produce a bit of downforce in itself but it also works in conjunction with the rear wing above and diffuser below to extract further downforce from both devices. Red Bull have been very effective at getting this trio of elements to work well with eachother over the years. Disallowing the beam wing also has another disadvantage as it effectively acts as a horizontal support to the entire rear wing. This has therefore meant that teams have not had to attach the rear wing endplates to the floor (although it has been done previously to gain an aerodynamic advantage) as a way of keeping the rear wing’s structure fairly rigid. We may therefore see the return of central rear wing supports that have been used in previous years. The beam wing is more of a managerial aerodynamic device that aids airflow above and beneath it. Having received some interesting information regarding one of next year’s cars, I have drawn up a potential solution that could help alleviate the loss of the beam wing. 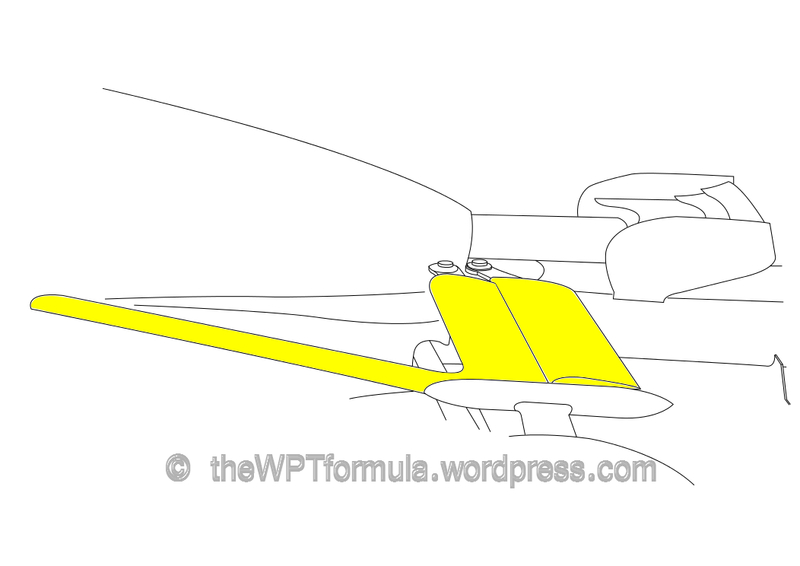 Highlighted in yellow you can see the top rear wishbone of the left corner assembly. The technical regulations define the maximum chord length and thickness of each wishbone but this solution aims to exploit a small loophole. The trailing portion of the wishbone is now made up of two pieces put together. This effectively creates one longer section. A longer chord length will guide airflow more efficiently around the rear wing endplates and, more importantly, extract more performance from the aerodynamic elements below (e.g. brake ducts, edge of the diffuser). 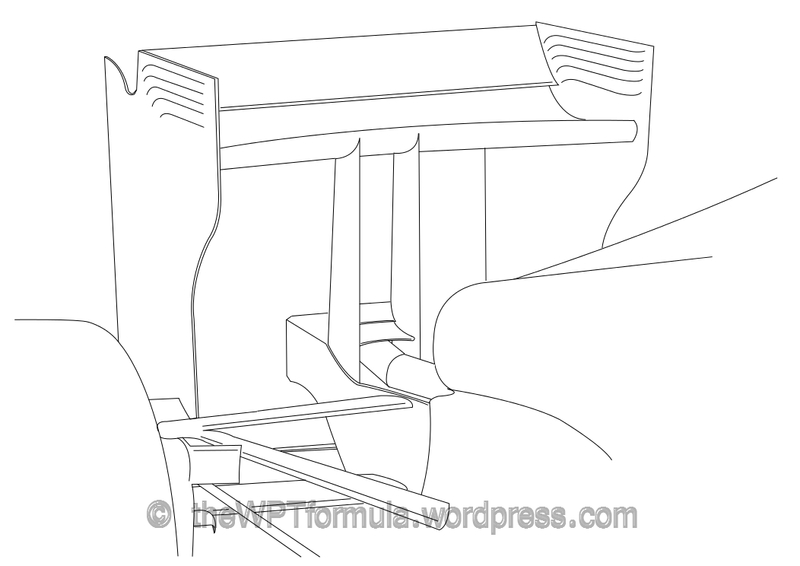 With more teams introducing brake ducts that exit hot air from the hub inwards of the rear tyre (rather than out of the wheel face), the extra chord length could stop this turbulence impinging on the rear wing directly beside it and preventing the hot air from rising next to sensitive bodywork. What you can also see in this image is the exhaust pipe exiting beneath the Y100 (Monkey Seat, previously Y75) winglet. The Monkey Seat is still allowed as, although there is no bodywork permitted between 150mm (top of the diffuser) and 750mm (bottom of the rear wing main plane) above the reference plane, the 150mm central section is still available for teams to exploit. The 2014 technical regulations are designed to negate any previous advantage that the exhaust pipes had in terms of aerodynamic effect. After discussing the placement of the exhaust at the base of the Y100 winglet on the f1technical.net forum, it was concluded that there would be a very small aerodynamic gain as the faster flowing exhaust gases being ejected beneath the winglet would in fact induce a small amount of downforce. The winglet itself must be at least 15mm above the exhaust pipe (there is an imaginary cylinder where bodywork cannot lie – 30mm greater in diameter than the pipe itself and 600mm long from the rear wheel centre line) so there is no way of moving it any closer to the hot gases below. Unless there is a way of melting certain sections of the winglet with the gases to reduce drag/create downforce (or something along those lines) then this appears to be the only way of extracting the best performance from the exhaust positioning. I will cover more on the exhausts when I do the power units section for 2014, or create an independent post for it. This is one of my first ideas so it is fairly basic. 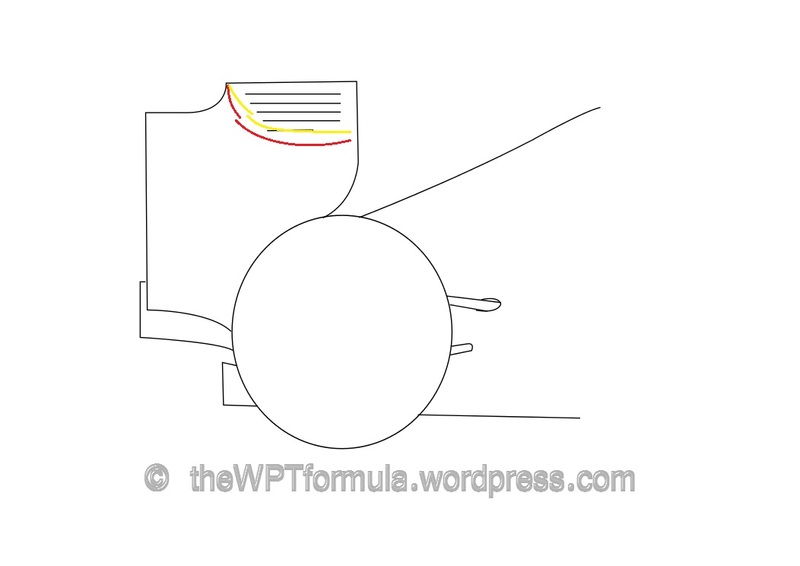 Getting rid of the beam wing creates quite a lot of room at the back of the car so the double wishbone idea could be quite effective although I have not included it in this drawing below. I have sandwiched the Monkey Seat between two supports, acting as endplates to the winglet. This kills two birds with one stone, for it also adds support to the rear wing and therefore the rear wing endplates can be designed purely around aerodynamic performance rather than structural rigidity. For the monkey seat/main wing center support, it would be much more beneficial to airflow if the supports attached from the top, high pressure region of the main wing. Hi, thanks for commenting. Sorry about the late reply. I would agree with you but the support will always cause blockage even to the underside of the wing, so still a loss.